It has been a while since I've been to a meeting like this. People drawn together by a cause, by their knowledge, and by a need for assistance. I had asked earlier if there were other educators in Seattle using XO laptops in their classrooms. I was the only teacher at this meeting, for sure. I was very intimidated by the level of expertise surrounding me. People were talking about re-imaging, builds, jabber, and sugar - to name only a few of the words whizzing around that I only knew a little about. But everyone was so helpful and friendly. Next to me was a dad with his son, trying to get a game downloaded and installed on their XO. A really nice and smart guy named Karl (from the UW, I think) was on my other side, providing tech support for even the silliest question I could offer. He told me how you "save", "open", and "explore" on the little guy. I took a picture here (with my XO) of folks across the table and put it on a flash drive. If you asked a question, it was as likely somebody across the room would respond as the person next to you. And there were three rooms full of us. I learned that Control-Q will force closed an application. I learned the SD slot (which I had just discovered earlier in the day) supports an unlimited amount of GB. I learned there is another Jabber server set up in Seattle, and I wrote down the location. And so much more. 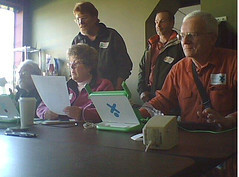 There was a guy who actually works for OLPC as a kind of regional rep. who spoke with the whole group for a while. That was real cool. People volunteered to start up hardware support regionally. I even spoke with a couple of folks after the official business was over about setting up a Ning for OLPC users. Here's a deal for ya. You learn everything you can about the XO and then this summer you and I get together over a cold one and you teach me! I haven't played with mine at all. Instead I handed it over to three 9th graders and said here....have a go. We'll see what happens. Jeff, you got it! So we don't have to meet at Starbucks for the free T-Mobile? Yippee!